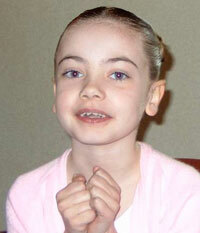 A guide on how to achieve the perfect look for the ballet exams for those doing Pre-primary to Grade 2. 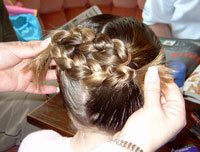 From Grade 3 the dancers need their hair in a bun. Thank you to Mandy Panaretou (hairdresser) and Sarah Webb (dancer) for our picture guide. 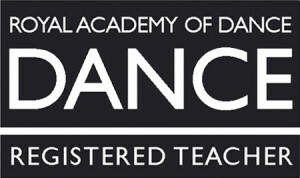 Please remember that your dancer will be awarded marks for their appearance. They must wear clean ballet shoes that fit perfectly to show off their pointed toes. Hair must be according to the guidance above. Practice makes perfect, the dancers really enjoy turning up to their extra exam practice with their hair in the exam style, it helps them feel the part. 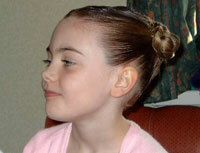 Part the hair down the middle and then scrape hair back into two bunches and secure with natural coloured hair bands. Please note that the bunches are just below the top of the head, see later pictures to see where these are positioned. 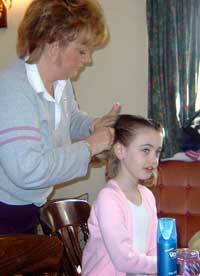 The plaits now need to be wrapped around the opposite bunch and secured with grips or hair pins, fixing in the ends. Cover with a natural hair net and once again secure with grips or hair pins.